SINGAPORE (新加坡) plunged into mourning and world leaders united in tribute on Monday after the death of Lee Kuan Yew (李光耀), the iron-fisted politician who forged a prosperous city-state out of unpromising beginnings. 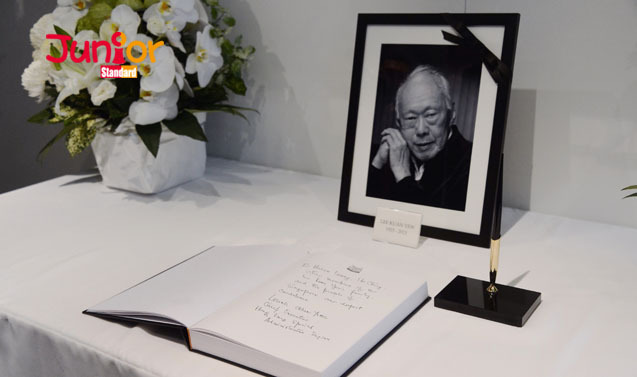 His son, Prime Minister Lee Hsien Loong (李顯龍 ), issued a statement before dawn announcing the passing of his 91-year-old father at Singapore General Hospital (新加坡中央醫院) following a long illness. He declared seven days of national mourning until the former leader is cremated on 29 March. “He fought for our independence, built a nation where there was none, and made us proud to be Singaporeans. We won’t see another like him,” the prime minister said in an emotional televised address. US President Barack Obama (奧巴馬) led world leaders in hailing Lee, who turned a small territory lacking its own natural resources into a world player in finance, trading and shipping – all the while with a heavy political grip that was long decried by rights campaigners. Lee served as prime minister from 1959, when colonial ruler Britain (英國) granted self-rule, to 1990. He led Singapore to independence in 1965 after a brief and stormy union with Malaysia (馬來西亞). Singapore now has one of the world’s highest per capita incomes and its residents enjoy near-universal home ownership, low crime rates and first-class infrastructure. But rights figures said his economic legacy came at a significant cost for human rights.